Yesterday was actually Deirdre’s birthday, so we had a party for her. I’d just arrived in Dublin when Ted got a call saying our wretched escape artist dog was loose, which seemed goddamned impossible because he’d been IN THE HOUSE but no, no, he was loose, he’d figured out how to open the back door ane made his escape, so I had to come tearing back from Dublin to get him and bring him home and lock him in more thoroughly and then go rushing back in to Dublin. I have never made the walk from the train station (where the lads who’d found the damn dog brought him to me) to the house so fast. I called a taxi to meet me there to get me back to the train station, figuring there was no chance at all with 5 o’clock traffic that I’d make the express train that would get me back to Dublin in a vaguely reasonable time frame, but to my sheer astonishment I made it with about six minutes to spare and got to the party. Ted, at Deirdre’s request, cooked a vegetarian Mexican feast of nachoes and enchiladas and rice, all of which was incredibly good. Wow so good. 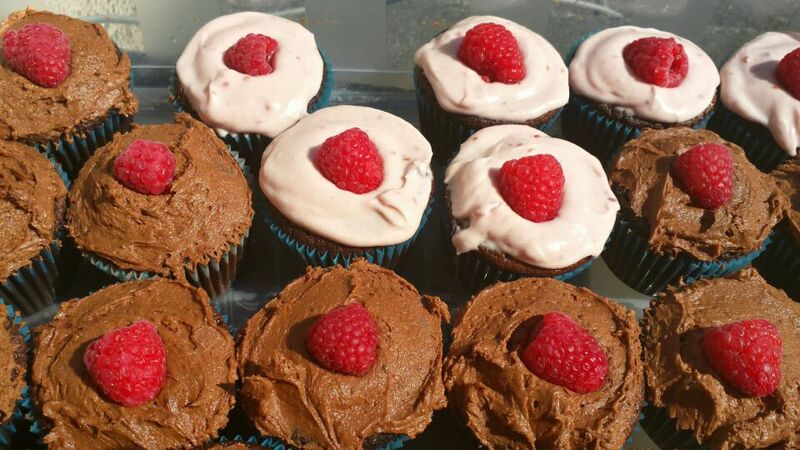 I made Stacked Raspberry Chocolate Cupcakes (recipe forthcoming at the patreon page next month! ), which were also a hit. And I gave Deirdre her birthday present, which was one of the Elfquest coloring books I’d gotten from last year’s Kickstarter. And lastly, during the party we were explaining the word “schlep” to my 13 year old nephew, and how it meant getting oneself (or something) from one place to another, but connotated effort, plodding, weariness, a heaviness of soul. So it was a good little party and I’m really glad I made it. Escape dogs, bad. Making it to the party on time anyway, good. Making your sister laugh...priceless. Sounds like a lovely day, despite the dog. I always give my brother and sister gifts in non tradtional bags, never wrapped, because, siblings....and they do the same back. Once in awhile, if a present is fancy wrapped, its an indication that they didnt pick it out and it is treated with suspicion... like it needs to soak in water to defuse the bomb sort of thing.